IBS is a functional gastrointestinal disorder that can lead to considerable distress and disability. Despite the fact that a gastroenterologist wouldn’t be able to find anything wrong with the tissues of the gut, it is clear that for people with IBS their intestines don’t seem to work, or function smoothly and easily. This results in frequent abdominal pain or discomfort. It can lead to chronic constipation, gas and bloating, to chronic, urgent, watery diarrhea or to an alternating mix of the two. IBS is often massively exacerbated by stress. People with IBS sometimes fall into classic maladaptive coping strategies – avoiding foods that are perceived as dangerous, avoiding social situations involving food and drink, avoiding places or situations in which it might be embarrassing or difficult to get up and leave to go to the bathroom, and avoiding venues in which they might not be able to get to a bathroom “in time.” If they allow this to escalate, people with IBS can become very limited – even homebound, since they’re afraid to drive or take the train, they’re afraid of getting stuck in a line or a row of seats or being too far from a convenient, clean and available rest room. A combination of catastrophic beliefs, visceral hypersensitivity (super awareness of sensations in the gut), anxiety about GI sensations and behavioral avoidance can leave people with IBS much more impaired than the severity of the GI symptoms themselves would predict. 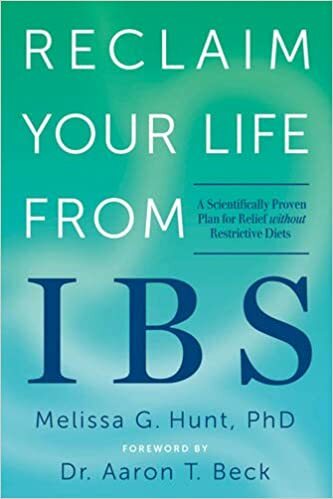 I have been doing research in the area of IBS for many years and have developed an effective, cognitive-behavioral self-help program that targets all of these difficulties. I have tested the program in two separate randomized controlled trials (the gold standard in science for testing whether a treatment works) that showed that people who complete the program experience significant reductions in GI symptom severity and improved quality of life. I’m pleased to announce that my self-help book, Reclaim Your Life from IBS, is now available for purchase through Amazon.com or at Barnes and Noble online.